After Thanksgiving there’s always a bunch of turkey leftovers and finding delicious ways to use them up can be challenging. 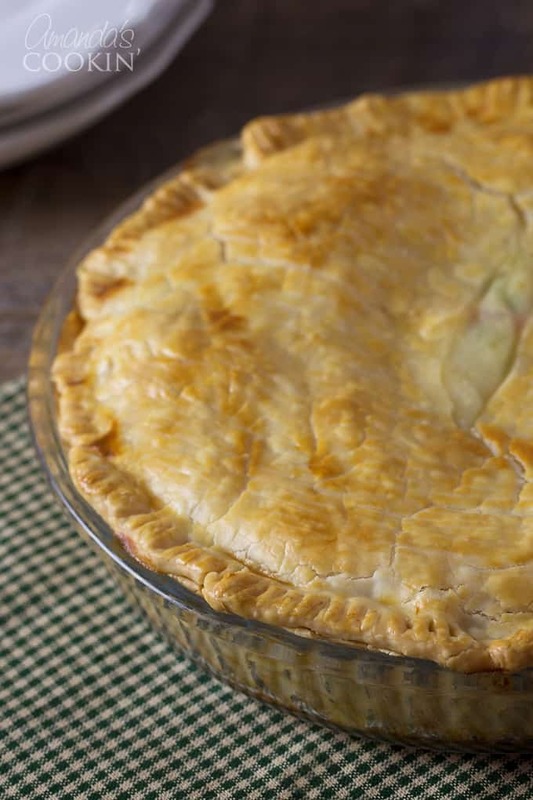 Believe me when I say you must make this homemade pot pie. You can use turkey or chicken, it’s divine either way. 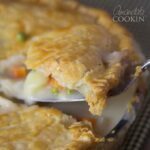 The flavor of this pot pie is the best I’ve had! This recipe comes from The Best Chicken Recipes which is a fabulous hard bound book FULL of wonderful recipes. I originally checked it out from the library, but have since ordered my own copy. 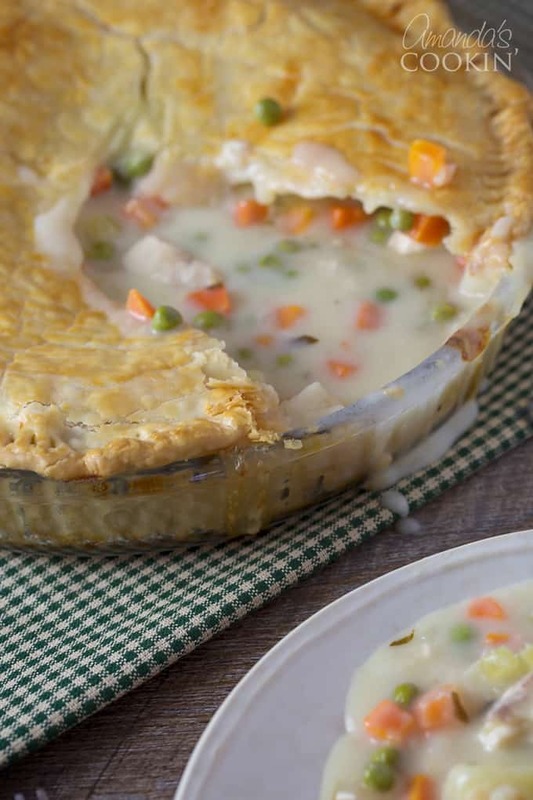 This pot pie recipe has earned a permanent place in my recipe library. The fact that it makes 2 pies is great, you can freeze one to bake another night. I’ve made several recipes from this book, it’s definitely keeper, and it’s full of helpful diagram and tips. Plenty of advice on different kitchen tools and gadgets as well. One of the things mentioned in the book is that you can certainly make your own pie crust, and they do offer a savory pie dough recipe for you to use, but they also offer advice on store bought doughs. Since you will need crust to go on top of each pie, you don’t want to buy those preformed pie crusts, you want the rolled out doughs, like Pillsbury. This isn’t a product endorsement, I just happen to really like their dough and it’s easy to work with. The only issue with using the store bought dough is that you cannot place round precut dough into a 13×9 pan, you must make two 9″ pies. One 9″ pie was plenty for our family, hence why I froze the other. If you prefer to make one 13×9, you will probably want to make your own crust. One more note: This recipe uses vermouth. I buy a bottle of dry Vermouth for $5.00 at the local wine shop here in town. It lasts me a long time and works great for cooking, you can use it as a substitute in any recipe calling for dry white wine. In fact, I bought it originally because Julia Child suggested it in her book, Mastering the Art of French Cooking . 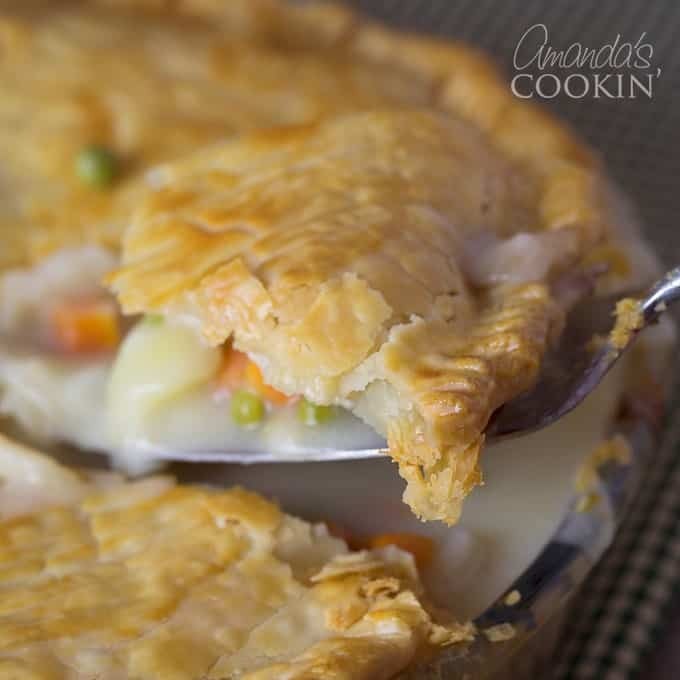 Hint: If you prefer your pot pie to be a bit more soupy, serve it right after you take it out of the oven. if you like it a little thicker, let it set up for 15-20 minutes before cutting into it. Either way it’s absolutely mouth watering. I promise you’ll add it to your regular rotation! Maybe you have leftover ground beef or lamb to use? Check out my Shepherd’s Pie recipe, which is great for tossing leftovers together to make one delicious dinner. Melt butter in Dutch oven over medium-high heat. 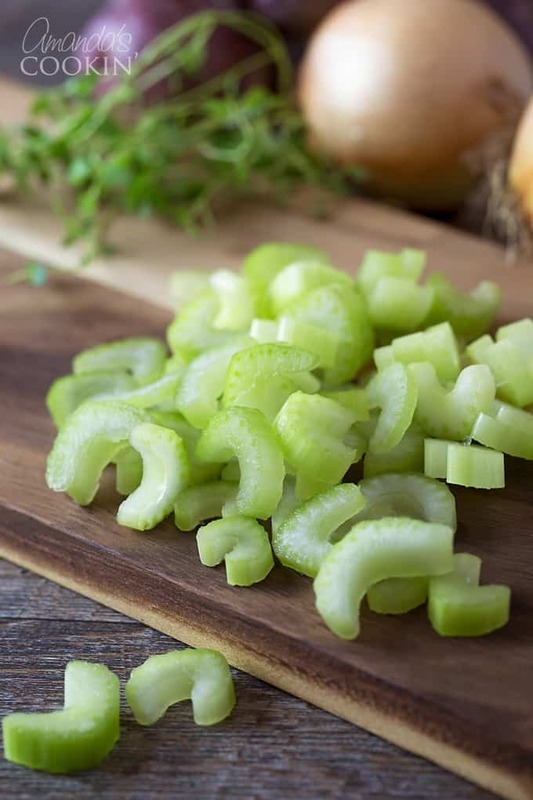 Add celery, onions and a teaspoon of salt, cook until softened and lightly browned, 5-7 minutes. Stir in the flour and cook, stirring constantly, until lightly browned, about one minute. Gradually whisk in the vermouth and cook until evaporated, about 30 seconds. Slowly whisk in the broth, cream and thyme. Add the chicken, partially cover, and bring to a simmer. Reduce the heat to low, cover completely, and cook until the thickest part of the breast registers 160-165, about 10-15 minutes. If using leftover cooked meat, simmer 15 minutes and skip next step, jumping to adding peas and carrots. Transfer chicken to cutting board and set Dutch oven aside, covered. When chicken is cool enough to handle, cut into bite sized pieces. 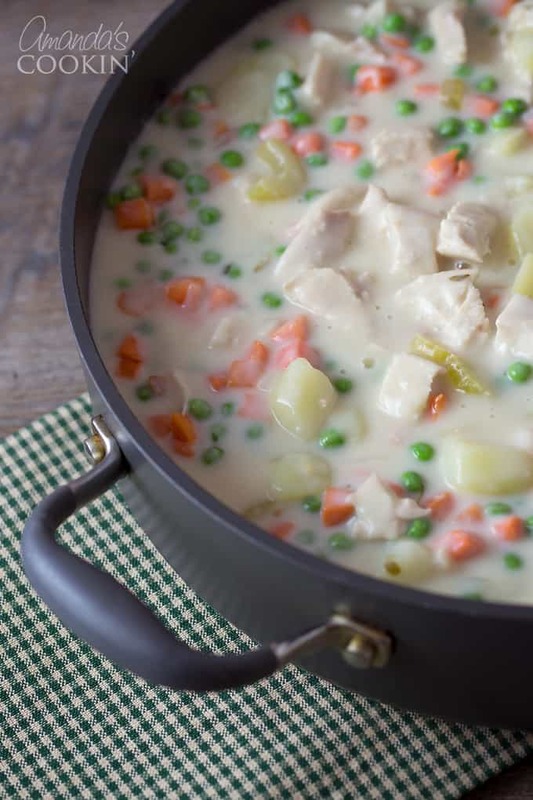 Return chicken to sauce with the peas and carrots. Add potatoes. Season with salt and pepper to taste. Pour mixture into 13×9 baking dish, or evenly split between two 9" deep dish pie plates. Roll out your pie dough and place it over the dish and crimp the edges tightly. Do not cut any slits in the crust. However, it may split on its own while cooking. At this point, the pie can be wrapped tightly in plastic wrap and then foil and refrigerated for up to two days or frozen for up to one month. If freezing, don’t thaw before baking. Increase baking time to 1 1/4 hours for refrigerated, and 1 3/4 hours for frozen. 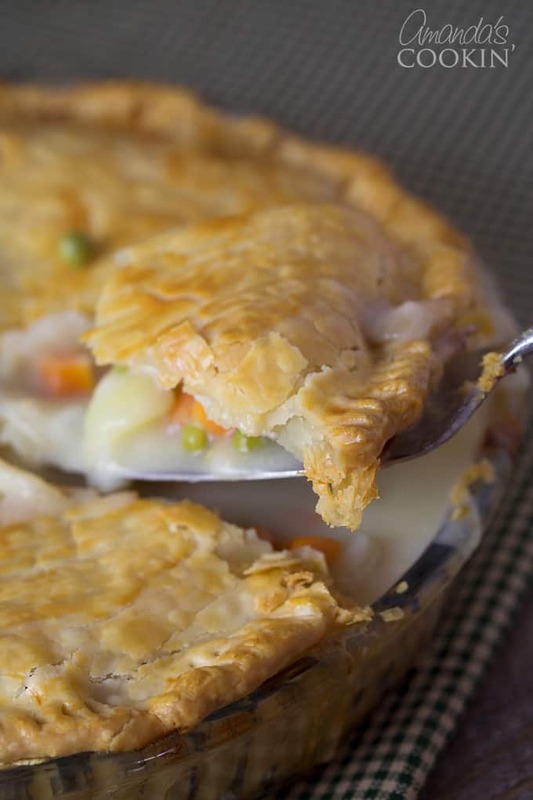 Place the pot pie(s) on a foil lined rimmed baking sheet. Bake until the filling is hot and the crust is golden, about 1 hour. Can u substitute the wine for apple cider vinegar? The instructions does not say when to add in the potatoes. Thank you for pointing that out, I have corrected the recipe! 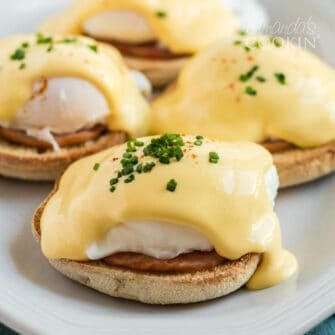 Could you also use ham in this recipe? Could someone use corn in place of the peas? Thank you for your time, have a wonderful Thanksgiving with your family and I hope to hear from you soon. Hi Michelle! I don’t see why ham wouldn’t work, should be a perfectly acceptable substitute. And yes, you can change out the peas for corn! 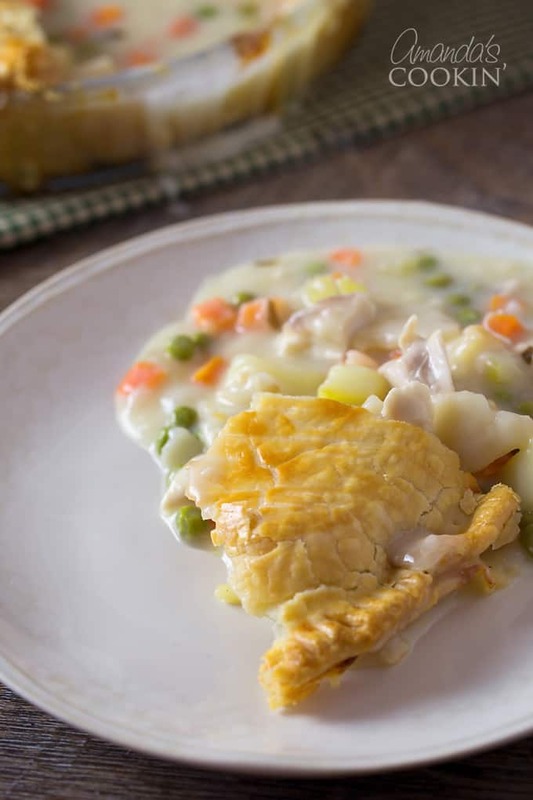 That great ideas on freeze the pot pie because I make one for my older son he loves turkey pot pie and now I will make the chicken pot pie for him to put in his freeze and cook it later. Thanks for a great idea. soup gives it the old fashion taste..Perfect for a crisp chilly night. Thanks everyone, this was a wonderful recipe!